THIS EMPOWERING APPROACH FOCUSES ON HELPING OTHERS TO GAIN SELF-AWARENESS, IDENTIFY PERSONAL VALUES, CULMINATE SELF-ACCEPTANCE, AND TAKE EFFECTIVE ACTION TO BUILD SELF-BELIEF, SELF-COMPASSION AND LIFELONG HEALTHFUL BEHAVIOR CHANGE. Mindfulness and Meditative Practices: I teach present moment and stress management skills derived from mindfulness and/or meditative practices such as Shambhala Meditation, Transcendental Meditation, Guided Meditation, etc. These practices facilitate greater awareness, more openness and greater perspective taking, and more meaningful and enhanced functioning. Mindfulness-Based Health Management: Using a combination of the psychotherapeutic techniques of CBT, ACT and the practice of mindfulness, whether at the individual or group therapy level, this is a unique program that helps kids, teens, young adults and their families better understand their thoughts and feelings and create long-term sustaining healthful behavioral changes. The mind-body strategies are engaging and user-friendly and includes relevant examples, exercises, and case studies that will be easy to relate to and put into practice every day. 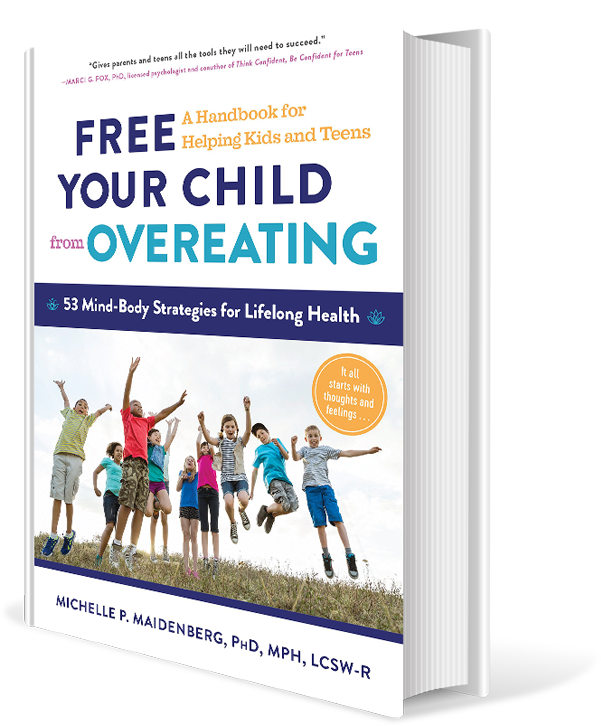 This practice is for everyone: kids and teens who overeat, are overweight or are obese. My services can serve as a stand-alone program o as a supplement to working with a practitioner (nutritionist, therapist, etc.). The mind-body strategies will empower individuals to take personal responsibility for their health and foster a better understanding of how thoughts impact feelings which impacts healthful behaviors. In additional to highlighting different skills, every session concludes with a mindfulness exercise to boost self-acceptance, self compassion and the practice of loving kindness toward oneself.